Judging from General Motors' test cars and Elon Musk's predictions, the world is headed toward a future that's both driverless and all-electric. In reality, autonomy and battery power could end up being at odds. That's because self-driving technology is a huge power drain. Some of today's prototypes for fully autonomous systems consume 2 to 4 kilowatts of electricity -- the equivalent of having 50 to 100 laptops continuously running in the trunk, according to BorgWarner Inc. The supplier of vehicle propulsion systems expects the first autonomous cars -- likely robotaxis that are constantly on the road -- will be too energy-hungry to run on battery power alone. In an industry where the number of LEDs in a brake light are scrutinized for their impact on gas mileage, processing data from laser, radar and camera sensors will be an enormous challenge -- not just for coders working on machine learning, but for engineers trying to power vehicles efficiently. As major markets from California to China ratchet up pressure to curb pollution, automakers and their suppliers will have to find creative new ways to offset emissions produced by feeding the car's increasingly intelligent brain. "We've been battling all the time because the governments are always pushing for a few percent improvement every year," Scott Gallett, vice president of marketing at BorgWarner, said of fuel-economy standards. "This just amplifies that challenge." The autonomous features on a Level 4 or 5 vehicle, which can operate without human intervention, devour so much power that it makes meeting fuel economy and carbon emissions targets 5 to 10 percent harder, according to Chris Thomas, BorgWarner's chief technology officer. To be sure, those calculations are based on prototype cars with sensors rigged on the roof, and the power demands of electronics inside the car will inevitably fall as the technology improves. But even if chip makers pull off promises to reduce power consumption by as much as 90 percent, automakers will still need to make fuel efficiency gains elsewhere in the vehicles to compensate for all that computing, Thomas said. "They're worried about one watt, and now you're adding a couple thousand," Thomas said. "It's not trivial." A fully autonomous subcompact car such as a Honda Fit, for example, will get 54.6 miles to the gallon in 2025 in the best-case scenario, more than 5 miles below the U.S. emissions target, according to BorgWarner. A small pickup or utility vehicle would be at 45.8 mpg, vs. a target of 50. Engineers don't have much time to resolve this, as companies are planning to deploy their first fully self-driving cars in the next couple of years. 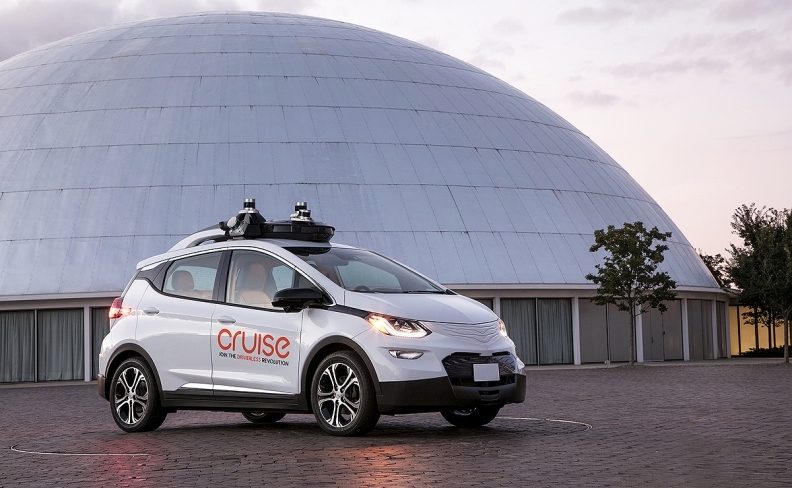 GM's Cruise Automation announced last month that a version of the all-electric Chevrolet Bolt that can operate without a driver is now capable of being mass produced. Musk had said Tesla Inc. plans to demonstrate a fully autonomous cross-country trip by the end of this year, although he cautioned during an earnings call in August that the timing of the drive may slip. One way for automakers to meet the power-hungry needs of self-driving systems will be to use gasoline-electric hybrid models rather than purely electric cars, said Mary Gustanski, chief technology officer of supplier Delphi Automotive's powertrain business. Sam Jaffe, founder of Cairn Energy Research Advisors, said hybrid-electric vehicles probably make sense for the first driverless cars, which are likely to be robotaxis. "They're going to favor plug-in hybrid EVs, and they're going to require that extra gasoline engine, both to extend the range to be able to do a taxi type of duty cycle, but also to help mitigate the proportion of the autonomous systems on the battery pack itself," said Jaffe, whose research and consulting firm specializes in energy storage. Alphabet Inc.'s Waymo, which started an experimental service ferrying people around in its self-driving cars in Phoenix earlier this year, has been using Chrysler Pacifica hybrid minivans. Another automaker envisioning autonomous hybrids is Ford Motor Co., which said last week it had set up a new unit to accelerate development of electric vehicles. "If you are trying to maximize your utilization" of an autonomous vehicle, a battery-electric car "is really restrictive for your business," Jim Farley, Ford's president of global markets, told investors on Oct. 3. He said Ford believes hybrids are "the right tech to start with."